One Page Checkout is a new simple way to pay for orders. Instead of tiring page to page process now your customers can fill in all necessary information on the same page in four easy steps. Below each step there is a dynamic Total Order Cost box that changes depending on what is selected, for example when tax is applied to some country, when shipping method is chosen or when a fee is applied for using some payment gateway. Customer can always return to the previous step by clicking on the step title. One Page Checkout is activated by default. 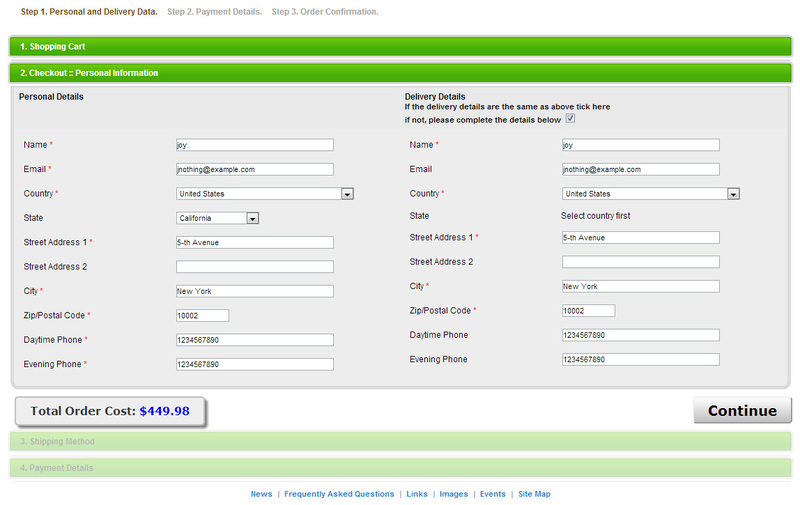 The main page layout (order_info.php) is available in CMS > Pages Layouts > Checkout :: Main. One Page Checkout is not possible to turn off. Since v.4.1 selecting shipping method is a required step to finish checkout however if you sell digital goods in that case shipping will be skipped. Note: Now to skip payment details fields it's not enough to add a file like money_order.php but you need to deselect all fields in Settings > Orders > Payment Systems > Personal > Payment Details Page.